One thing I really miss living in the UK is live crabs. In UK we get boiled crabs but live crabs are so difficult to find and can be very expensive. I have tried frozen cooked crabs from Lidl they were full of water and hardly any meat at all. 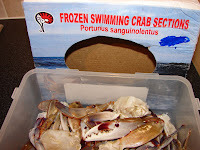 Today I saw some frozen raw crabs from the Chinese supermarket. I have to give this a try. 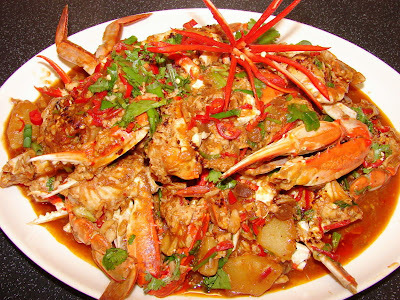 Chilli crab is something I have in mind that I have not had for many years. This recipe is lip smacking and finger licking good i.e. if you like eating with fingers and crunching crab shells. Dressed crab don't work with this recipe. If you don't like crab shells, you can sub with extra large king prawns with shell or lobster cut into chunks. If using prawns use less water/ pineapple juice. The crab turned out to be rather nice though not as good as live. I will try again when I have a craving. Small handful of coriander, roughly chopped. Heat wok or large pan with oil and fry ginger for about 30 sec, add garlic and stir till slightly brown, then add yellow bean paste, shrimp paste and chilli and stir fry till the mixture gives out very strong fragrance. Add crab pieces turn the heat to the highest and stir fry for a minute or two (if using raw crab cook a bit longer). Taste if it is salty enough if not add dash of soy sauce, sugar to taste, tomato ketchup, tamarind, water, pineapple and its juice, tomatoes pieces and stir, covered and cooked for about 5 minutes till steaming hot and the sauce is bubbling hot. Pour the beaten egg in long thin stream into the boiling sauce and stirring the crab slowly at the same time so the egg cooked like ribbons. If the sauce is not thick enough, add enough cornflour solution to thicken. Add chopped spring onion and coriander. Ready to plate up. Drizzle some chilli oil to make the sauce looks glistening and reddish if wish. Decorate with more spring onion, coriander and chillies. * If the sauce is not spicy hot enough can add in as much hot chilli sauce like Sriracha. Serve hot with rice and plenty of cold beer.